When I mention crochet, the first thing that comes to many people’s minds is the granny square; almost everyone had or knows someone who had an afghan made from these squares draped over their sofa. And while sometimes the granny square gets a bad rap, these little motifs are the perfect way to use up scrap amounts of yarn. Plus, since they are worked from the center out, you can just stop whenever your square is the necessary size. Granny squares have been showing up on runways again (in fact I’m stitching something from grannies this week!) and when they are done well, they are a loveable classic. 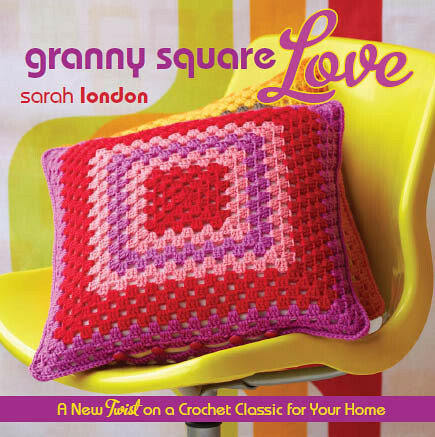 Sarah London’s new book, Granny Square Love: A New Twist on a Crochet Classic for Your Home , pays homage to this classic crochet building block. Sarah is known for her bright and fun color combinations, and the combination of crochet and printed textiles in this book makes yummy eye candy for the crafty at heart. The book contains about twenty five projects–all for home/decor use. Each one is fully written and diagrammed, which I like, and the book also includes a breakdown of the basic stitches and a really useful photo tutorial on making granny squares. I should mention that most of these projects use the traditional granny or a slight variation on it (ie. 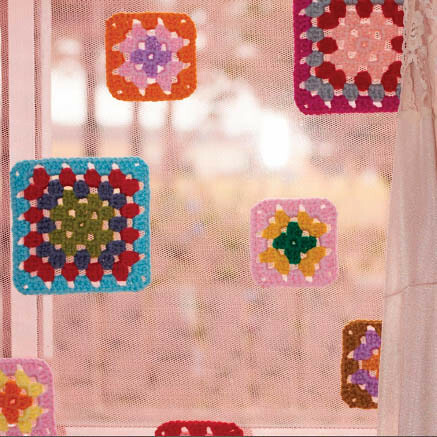 in this case, Granny does not mean square motif, it means Granny Square)–which puts almost all of them in the easy category, making this a perfect beginner book. My one hesitation with this book is that there’s no gauge information listed–not a big deal for certain projects, where you can just stop as the square approaches the desired size, but it would certainly be helpful in others where multiple squares are used, and helpful for planning color changes. However, you’re only a few quick calculations away from determining the gauge yourself (just divide the finished measurements by the # of rounds in a square to get an idea of the rounds per inch). 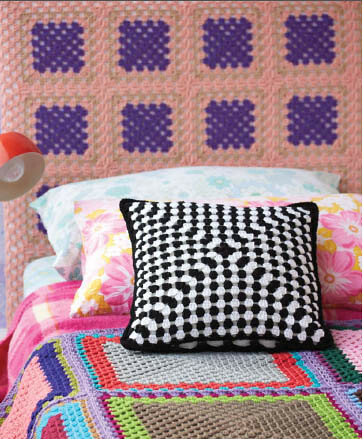 I’ve scattered some of my favorite projects from Granny Square Love throughout this post. Each one is a delight to look at, and I know most of them would be super quick to make. I love knowing that Sarah shot each of these photos herself! If you read her blog, you’re already familiar with her style and unabashed use of bright colors. She also gives color notes and inspiration throughout the book, to help those of you who might not be so fearless with the mixing and matching….yet. If you want to snag your own copy of Granny Square Love, you can get it for $12.99 in the Martha Pullen Online Store by using the promo code GRANNYTOUR (valid only through October 8th, limited to in-stock copies) or using my affiliate Amazon link. F+W Media has also offered me one copy to give away to a reader (US addresses only, please). To enter to win, answer the following question by Thursday, October 7th at Noon CST. How do you usually pick colors for your crochet (or craft) projects? Do you have colors in mind, wait for the yarn to inspire you, or have some other crafty technique? Full Disclosure: F+W Media sent me a free PDF of the book to review for this blog tour. I pick the project first (e.g. baby blanket) and then go through the colors I have until one pops out at me. A lot of the time I buy the yarn because I am attracted to it and then I find something to make with it. But I also will find yarn that either works with a particular project or what the person I am making the item for wants. I usually head over to my local craft store and spend about 30 minutes selecting different color combinations until I find one I like. :) My husband hates when I drag him along. Sometimes I photocopy the design in black and white and look at it for awhile to think of what color it inspires. Oh GOSH! I want this book so badly - thanks! Sometimes to choose project colors, I will dump a bunch of skeins on the floor and see if I can come up with new color combinations that way. Then I can't over-think it.